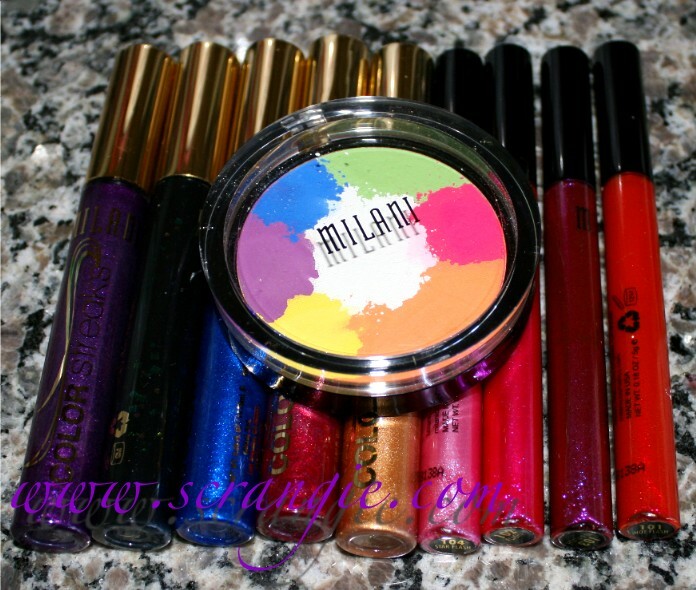 This is a collection of Milani makeup and nail polish that's only available for the month of July. It includes the neon Paint eyeshadow palette, four shades of Haute Flash lipgloss and eight shades of one-coat, fast dry nail polish. I was sent some Color Streaks hair mascara and I assumed it was part of the July limited edition items, but I don't see it listed on the website, so I don't know if they are or not! Fast Fuchsia. My picture makes this look almost neon, and it is bright, but it's not quite neon. For a pink, it's pretty nice. Great coverage and a nice solid looking creme finish. Racy Green. This is a blue-green shimmer. The shimmer particles are big, giving it a near glass-fleck finish, but it's not as shimmery or duochrome as a true glass fleck finish. Violet Dash. Light violet creme. AWESOME color, scary formula. It is extremely thick. Sure, it's opaque in one coat, but it's like trying to paint my nails with wallpaper paste. However, after a little Seche Restore, it was perfect. Love the color of this so much. The formula on the three shades I tried was so-so. They were all very thick, but the thickness caused them to be opaque in one coat. I did two coats anyway, but they only needed one. The thickness causes some bubbling, so I'd really recommend some thinner for these. Dry time wasn't as fast as I had hoped, probably due to the thickness. 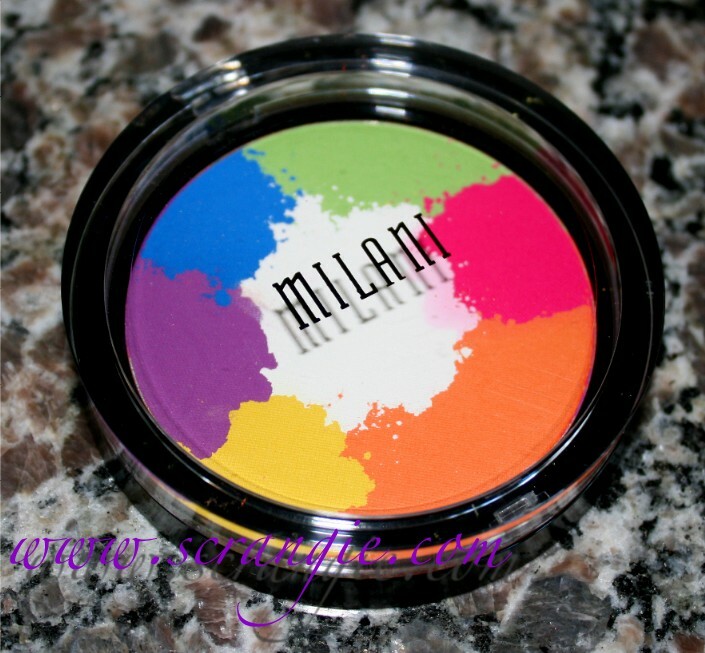 The Milani Paint eyeshadow palette is awesome to look at. 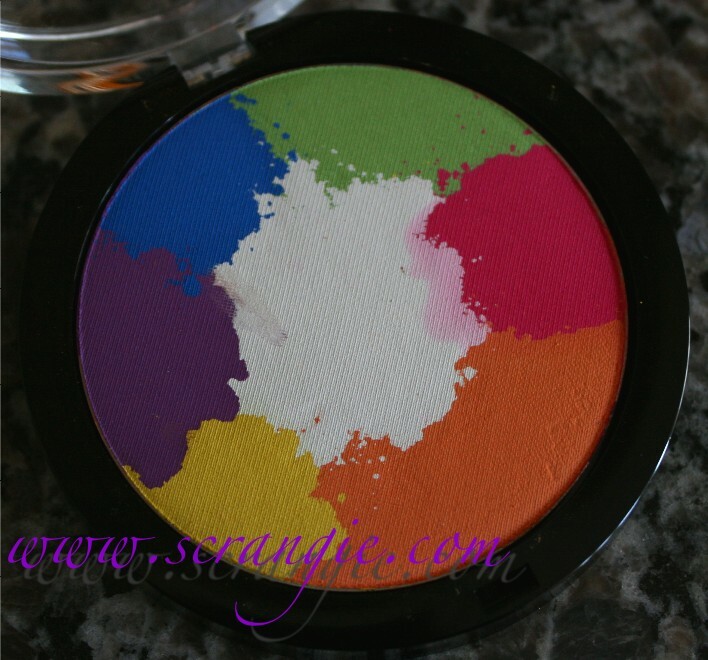 It's six bright, near-neon matte colors plus a matte white all mixed together like an artist's palette with little dabs of paint. Really cute design. Unfortunately, the colors are sorta chalky and sheer. 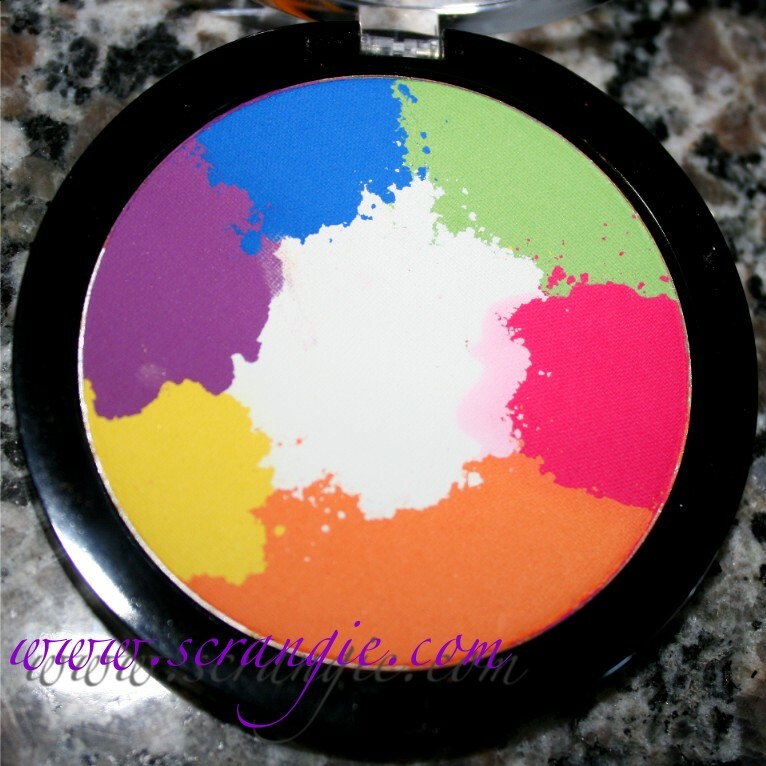 The pink and orange have the best pigmentation, the purple and blue have the worst. I haven't tried using these on my eyes or over a base yet, but the matte formula doesn't seem like it will be easy to work with. Still, cute palette... And the pink seems usable. 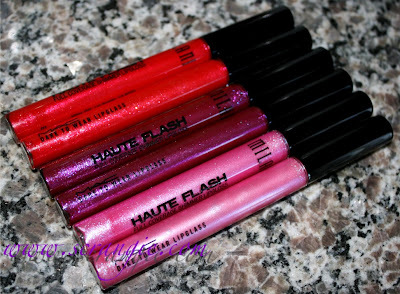 The Haute Flash is billed as a full-coverage lipgloss and it really is. It's very dense. 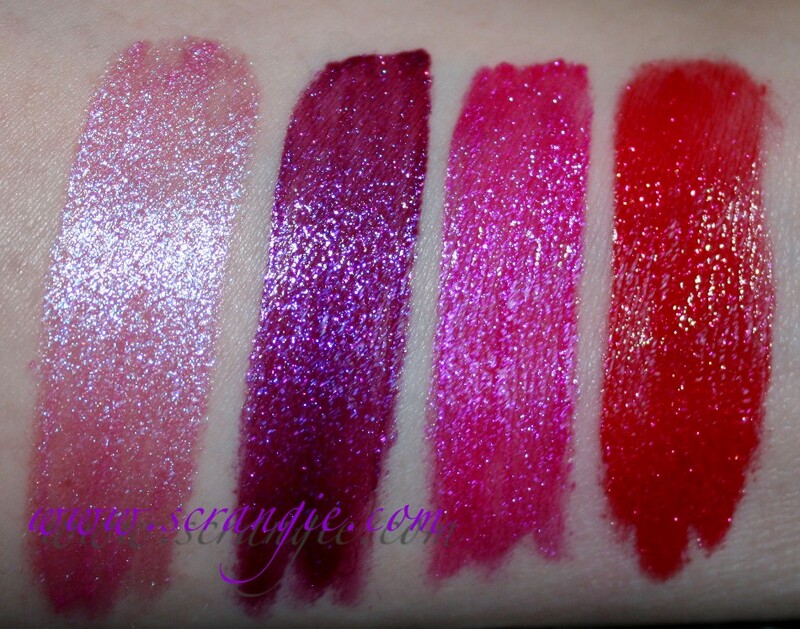 It comes in four shades: Hot Flash, Flashy, In A Flash and Star Flash. 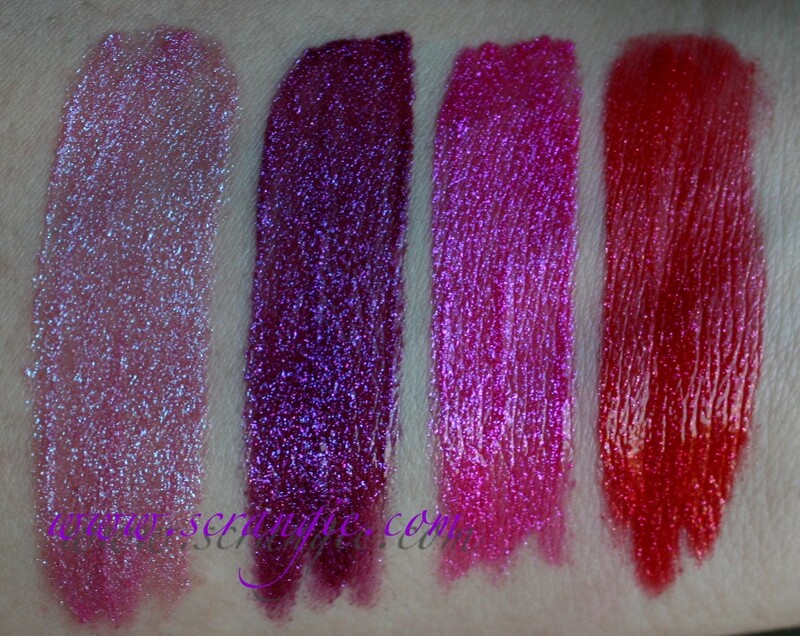 The colors are similar in shade and texture to their Lip Flash pencil counterparts. 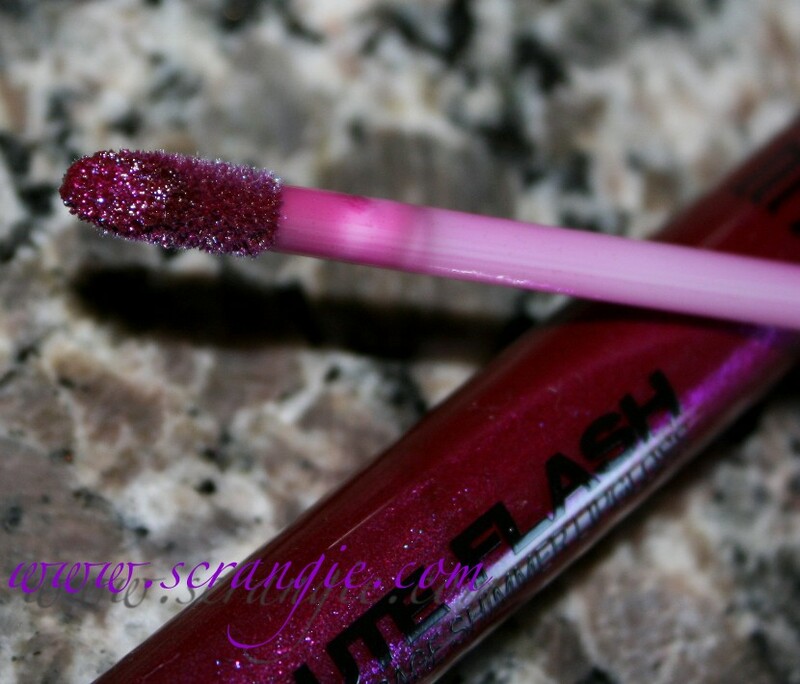 Haute Flash has a doe foot wand applicator and a very long, skinny tube. Left to right: Star Flash, In A Flash, Flashy, Hot Flash. Star Flash is a pale pink with blue duochrome shimmer. 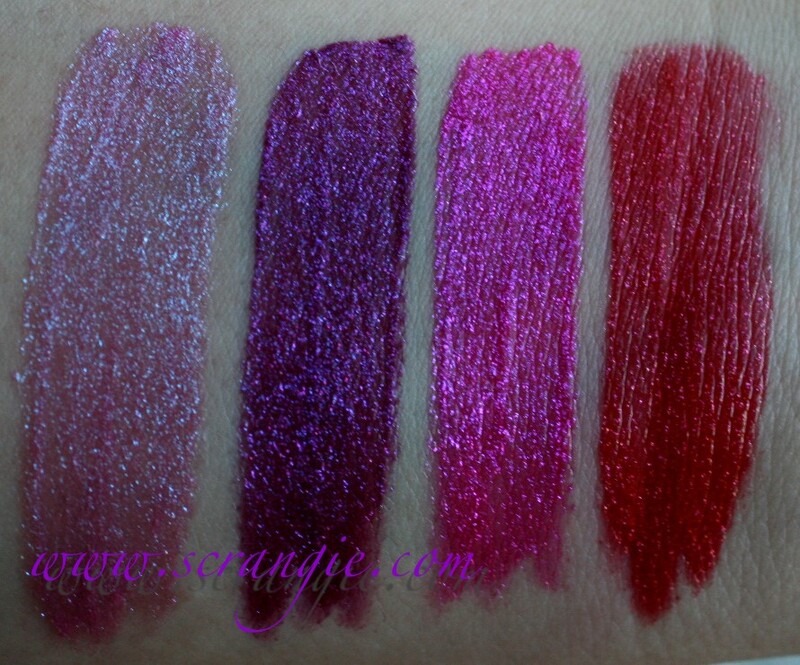 In A Flash is a dark purple with violet, blue and red duochrome shimmer. Flashy is a hot pink/magenta with blue-violet and light pink duochrome shimmer. 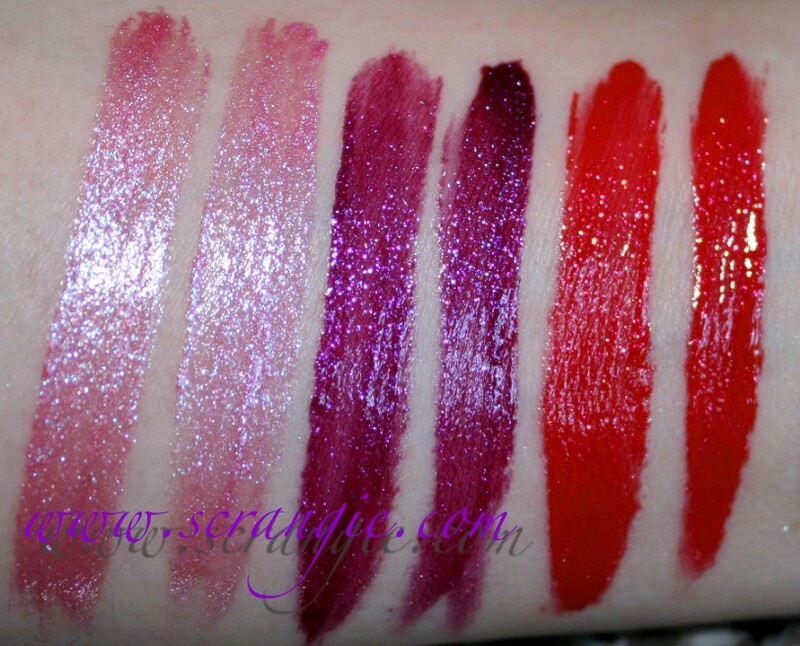 Hot Flash is a bright, flaming red with red, orange and pink duochrome shimmer. The formula is super thick. 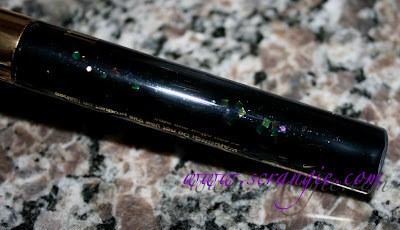 It's hard to get much product onto the wand, but once you do, it has great coverage. 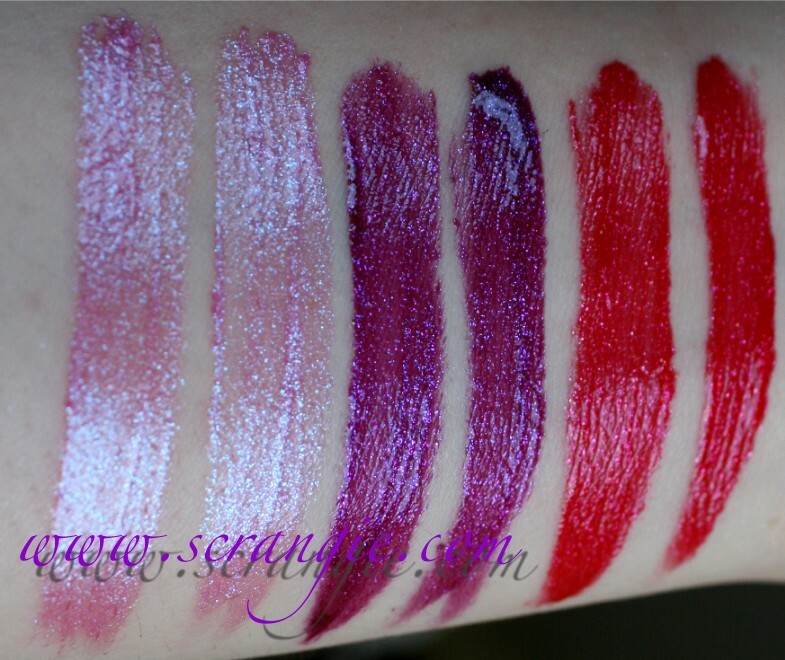 These have extremely dense, opaque shimmer-heavy color. 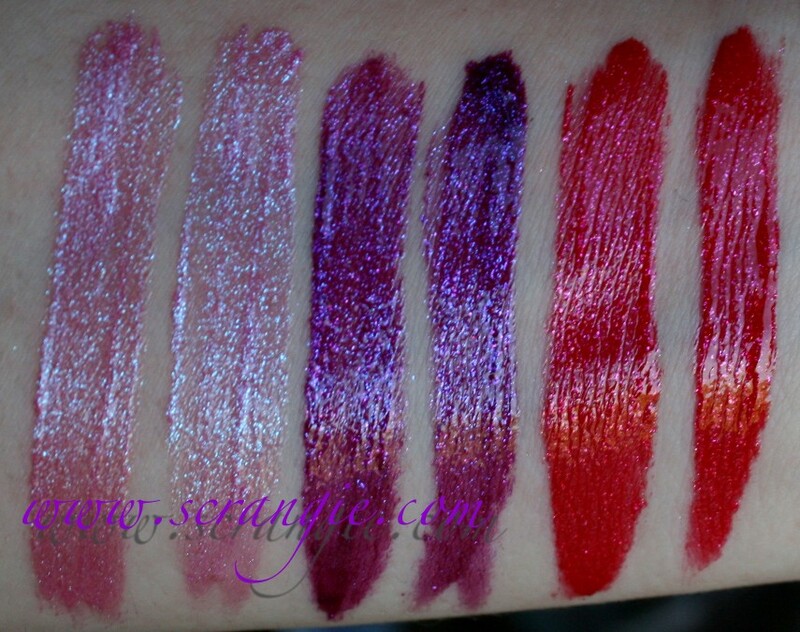 They're like a foil nail polish for your lips. 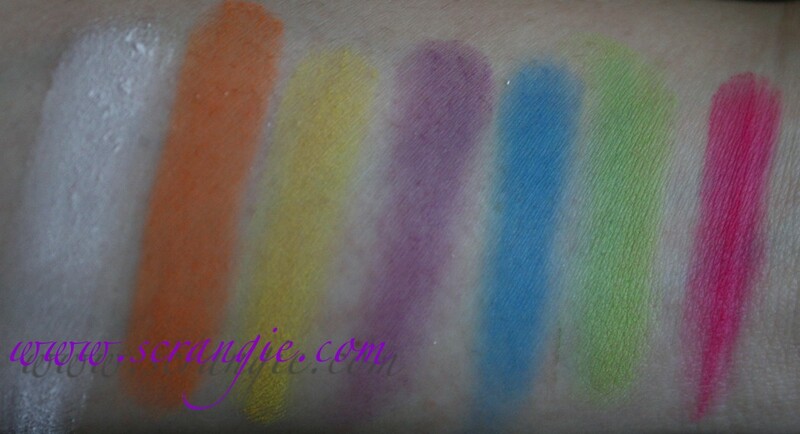 Each shade has lots of duochrome flash and shimmer and they last forever. I can easily wear this for 6 hours without having to reapply. Longer if I don't eat or drink anything, though it does last just fine through drinking. Once it does wear off, it stains, so there's still some color left on your lips. I know what you're thinking... these look familiar. Uh huh. They do. See? They look just like MAC's Dare To Wear Lipglass from last year! Milani Hot Flash looks like MAC Bold and Brash. Milani In A Flash looks like MAC Ban This!. Milani Star Flash looks like MAC Dare To Dare. I don't have it to compare, but Flashy looks like is could be MAC Gimme That! 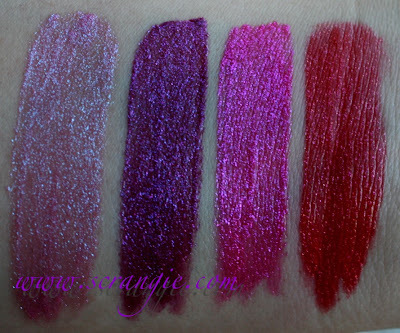 Left to right: MAC Dare to Dare, Milani Star Flash, MAC Ban This!, Milani In A Flash, MAC Bold and Brash, Milani Hot Flash. There are slight differences between the colors, but honestly, they're so close I'd never be able to tell them apart. Everything about this is practically identical, from the formula, the tube, the color and texture, right down to the beloved MAC vanilla scent. They look the same, wear the same, feel the same and smell the same. That makes me happy, because they're half the price of the MAC- $6.99. I only wish they came in more shades... The formula is great and I never got all of the MAC shades, but I'd be happy with half-price, equal quality Milani dupes! The Color Streaks hair mascara comes in five shades: Fun In Red, Solid in Gold, Cool In Blue, Awesome in Purple and Dramatic Shimmer. 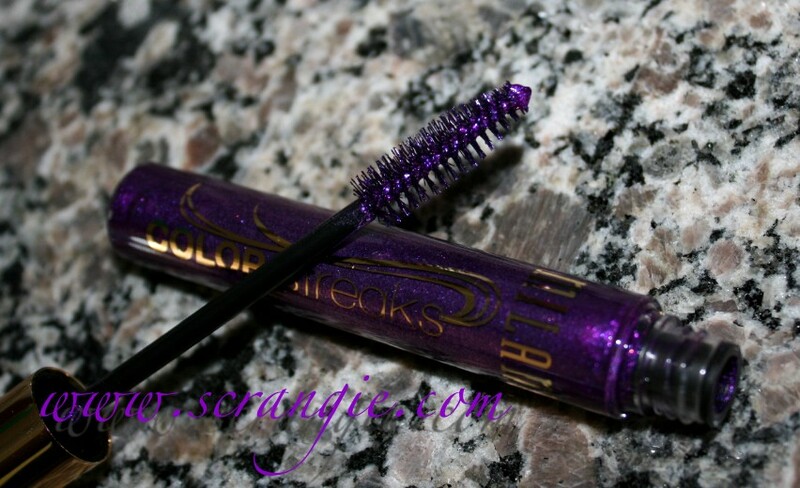 Just like the colored hair mascaras of old, the new Milani Color Streaks come in an oversized mascara tube. All the colors are shimmer-heavy and look very sparkly on the hair. Once they dry, you can brush through them to make them smooth and they won't flake off. Unfortunately, the colors didn't really show up against my dark hair, but they did leave hints of brightly colored metallic shimmer here and there. It looked like subtle, sparkly brocade threads running through my hair, which was pretty, but it wasn't the brightly colored dramatic look I was hoping for based on my experiences with the old 90's hair mascaras. I don't know if you can tell from these pictures, you might need to enlarge it to see... But Dramatic Shimmer is a black base with large, I'm talking gigantor huge, pieces of multicolored glitter. Squares, diamonds, circles, hex... All kinds of glitter in here. I've not seen a hair mascara like this before! It didn't show up on my hair and the glitter was hard to get out of the tube, but man, it looks killer in the tube. This would probably be awesome if you have light hair. 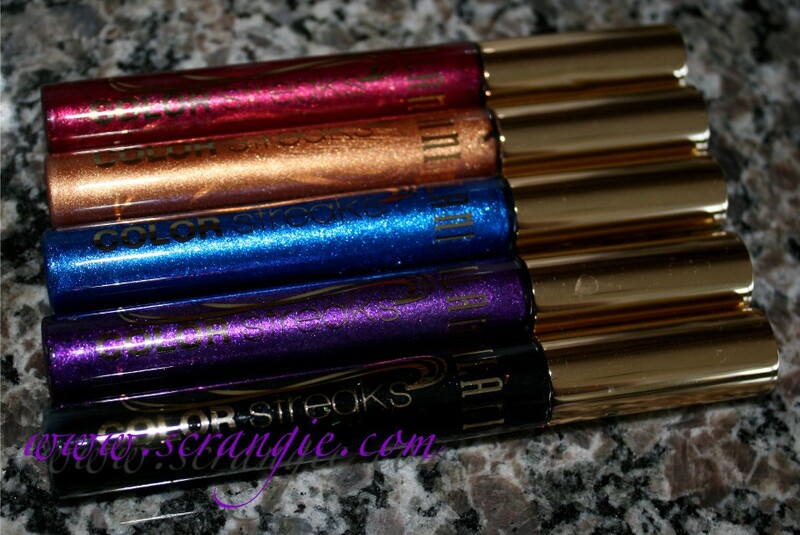 The color are very vibrant and shimmery. 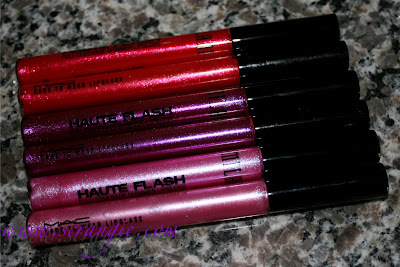 I like the Haute Flash lipglosses the best! They rock. I want them to make more shades of Haute Flash. I need an orange one! Just a few lines to tell you how much you have inspired me. Partially thanks to you, I'm back in to makeup and nail polish and have even just created a blog to share my passion with others. Have always been a makeup/polish junkie but I stopped using it as a media to express my creative side. Things are about to change! Thanks for the great reviews and swatches. I've been on the hunt for those glosses since the beginning of July. I've stopped by 5 CVS in two different cities and nothing. I'm so sad/pissed that I can't find it haha. Thanks for the review! I have the lip ones and the hair streaks. I can't wait to try them! The lip glosses are so nice and for that price?! BUY! I love the lipglosses! I really need to find them! Awesome colors! I could not find the Milani July specials in our two CVS stores in town and really wanted two of the lip glosses (Hot Flash and In a Flash) so I ordered online from Milani. $5 shipping but hey, I saved gas trying to hunt them down out of town! Oh lord! Hair mascara is coming back!!!?? 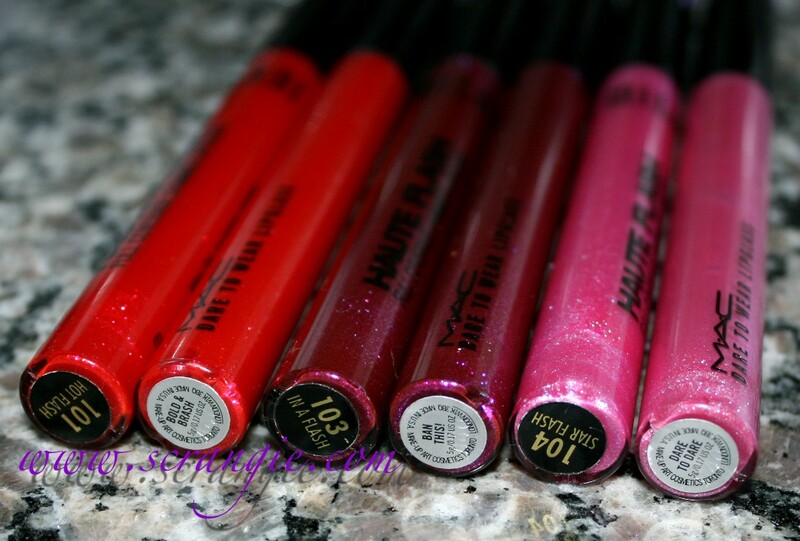 My first thought when I looked at the glosses was that they look exactly like the MAC Dare to Wear glosses. That's actually pretty cool. I can't believe they put out hair mascara. I had a tube of blue hair mascara in the mid 90s. Showmesara, hahaha that's what I said when I saw them! Deb, oh man, I had every color hair mascara plus those cans of spray on hair color that made a gigantic mess everywhere, remember those? How are these thick Milani's for stamping, Scrangie? Nina, I haven't tried it myself, but they seem like they'd be perfect. They're as thick as the Konad Special Polish so as long as they don't dry too quickly, they seem like they're the right texture! wow those glosses are sooo pigmented! I want the red lipglosses! I'm on a red lips kick lately. Anyone else? 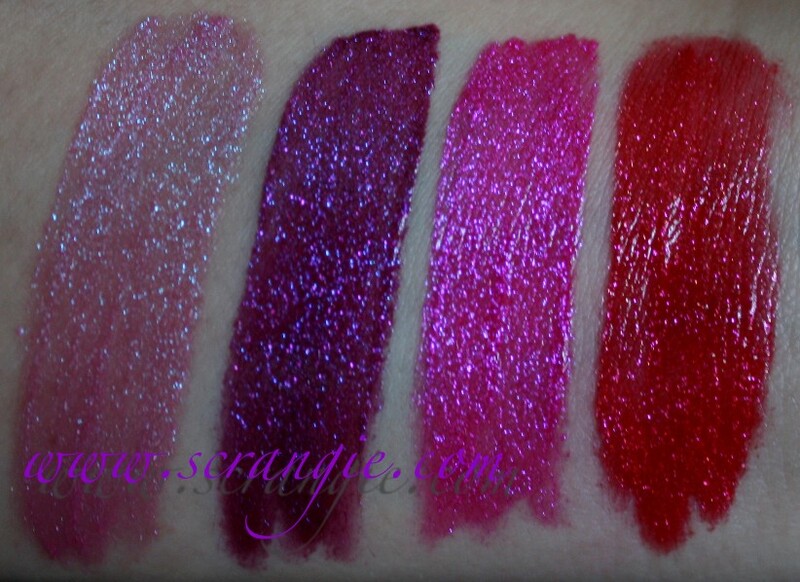 Ooh, the lipglosses look awesome! And hair mascara making a comeback??? SO into it! Oooh, I totally love the nail polishes! Back in the 80s when I had my sinead o Connor shaved head, I just used colored mascara on my hair. Didn't know they made something especially for hair! 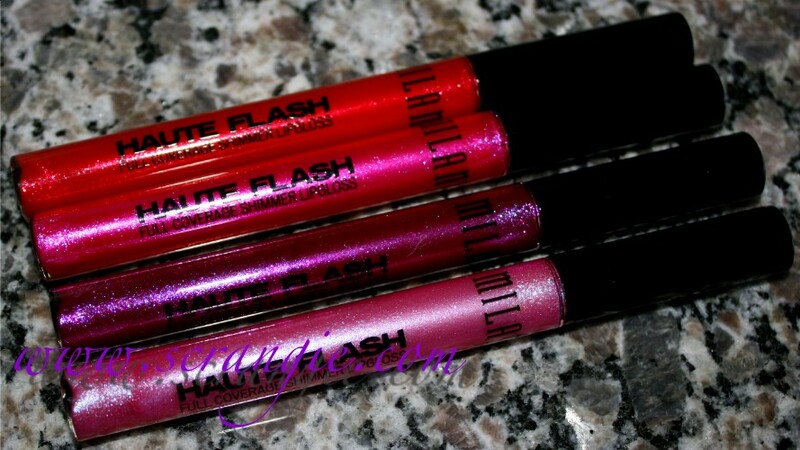 I need those lip glosses!! The colors are amazing.